As with most parts of the Society's history, this story starts some time earlier than one first thinks. The Society's first visit to the Irish Republic came as early as 1922, when a party did some archaeological investigations in caves in Co. Waterford. However, this was not followed up and the Society's main association with Irish caves dates from the 1940's. English cavers had already visited Co. Clare in pre-war days, Ernest Baker had been over as early as 1911 and parties led by Graham Balcombe and S.J. Pick had spent three Easters caving in Clare in the years 1936-8. It was not their work, however, but that of an Irish caver, Jack Coleman, that first sparked off our interest. Jack published a major paper on the Poulnagollum system in the Proceedings of the Royal Irish Academy in 1944 which was read with great interest by our members and eventually lead to four UBSS members; Charles Barker, Bob Bendall, Mike Gummer, and John Pitts; joining Coleman in 1948 and exploring, with him, High and Low Road passages in Poulnagollum. That first trip has been followed by further visits at the rate of at least one a year for every year since and has resulted in the discovery and exploration - and even more important the surveying - of many kilometres of cave passage. Foremost amongst the Society's discoveries have been such finds as the Doolin Cave System, Cullauns 1, 2 and 3, Gragan West Cave; Poulnagree, the Fergus River Cave amongst many others. And if the Society was not responsible for the finding of a number of others, such as Polldubh, Faunarooska, Poll Cragreagh and so on, then it is our members who have surveyed and recorded these caves.Our most recent significant discovery was the Priory Streamway, about 2 km of fine stream cave found beyond the sumps in Poulnagree which was first entered in 1999 by Steve Cottle and Andrew Atkinson. This work has been recorded in detail in our own Proceedings and in the journal Irish Speleology. The model for our work was set in the earliest days with the publication of Bendall and Pitts' report on the Coolagh River Cave whose detailed surveying and observation was of a standard rarely seen in those days, but one which has been maintained in our subsequent publications. Foremost amongst these are our books: The Caves of North-west Clare, Ireland, edited by E.K. Tratman was published in 1969 and The Caves of County Clare, edited by Charlie Self was published in 1981. Our third book on this area, the Caves of County Clare and South Galway, incorporating a gazetteer of all known sites and bringing the scientific view up to date, was published in 2003. The fourth edition, which will include information on the remainder of Galway and on County Mayo, is now in preparation. Detailed reports of our work in Ireland can be found through the literature search page One report published by the Society, but not in our "Proceedings", is a monograph on the Doolin Cave written and produced by our then Treasurer Dr. Oliver Lloyd. The cumulative of our (and others) survey work has been put together in a 3d model showing the vast majority of the caves in Co. Clare. This model may be found on our Cave Survey Archive page. We have also produced more "informal" accounts. in the late 1950s and early 1960's Oliver Lloyd used to write an annual calypso describing that year's trip. From 2012 to 2016, the main focus of our Irish visits has been the Cong isthmus in Co. Mayo and the neighbouring part of Co. Galway. The detailed reports from these trips are to be found in the list below, but rather less formal accounts (and more photos) can be read in recent numbers of the Newsletter. Look on pages 16-17 here for the 2012 trip, pages 13-15 here for the 2013 trip, and pages 9-11 here for the 2014. All the detailed information from these visits will be, we hope, incorporated in the next edition of our guide book. The Society has not limited its activities to Clare. Descriptions of caves in other areas can be found in the papers listed below. Gregg, A., and Podesta, J., 2016. Cave Notes: Co. Clare and Co. Galway, Ireland. UBSS Proceedings, 27(1) , pp 99-104. Smith, E.R.M., 2015. Caves Notes: County Mayo, Ireland. UBSS Proceedings, 26(3) pp 249-258. Podesta, J., 2014. Caves Notes: County Mayo, Ireland. UBSS Proceedings, 26(2) pp 185-200. Hadfield, S., 2013. Caves Notes: County Mayo, Ireland. UBSS Proceedings, 26(1) pp 101-104. Drew, D.P., and Hickey, C., 2004. Caves of County Roscommon. UBSS Proceedings, 23(1) pp 35-50. McShea, H., and McShea, J., 1969. 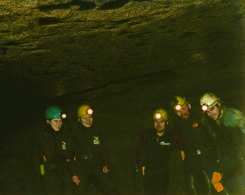 Caving expedition to Sligo, August 1967, Ireland. UBSS Proceedings, 12(1) pp 113-116. Squire, J.E., and Squire, R., 1964. Caves in the Tralee Area, Co. Kerry, Eire. UBSS Proceedings, 10(2) pp 139-148. Tratman, E.K., 1957. [Expedition to] Leitrim, Eire, 1956. UBSS Proceedings, 8(1) pp 49-68.